I have posted on this earlier too……. the culture of statues has a long history and is not new to Tamilnadu alone – and there have been some clashes arising out of issues involving statues, it is another colonial vestige. At important road junctions, at landmark buildings – we have statues of leaders and others lying uncared for in a state of neglect. There are statues in a row in the Marina beach with bird droppings and dirty looks. In the northern State, one CM went berserk installing statues of party symbol and self and the opposition leader appealed to the Centre not to release funds to State fearing that they would create more statues. Originally, statues were installed to propagate the memory of great leaders, poets and visionaries of the Society and even in a place where rationalists question religion, there arose very many statues to leaders of importance. It was to instill in upcoming generations some knowledge and recalling of the glorious acts of the erstwhile leaders. It is unfortunate that instead of learning, sometimes they become the reason for public disturbance. Statues – installing them is another vestige of colonial rule. A few years ago in 2006 eight foot bronzestatue for Villupuram Chinnaiahpillai Ganesan Manrayar [you know him better Sivaji Ganesan] was installed in the middle of the beach road …….. a freedom fighter objected the positioning stating that it would obstruct the view of the Gandhi statue and filed a PIL. The Bench of Madras High Court which heard the case advised not to put up. The statue was installed and for months gun totting police stood vigil in Sun. The Madras High Court has recently ordered shifting away of the Sivaji statue from its present place. ~ there are so many of them dotting the Marina beach – of Poets : Kambar, Ilango, Avvaiyar, Thiruvalluvar, Bharathiyar, Barathidasan stand amidst Kannagi, Gandhiji, Kamarajar, Nethaji Subash Chandrabose, Annie Besant, Swami Vivekananda, Swami Sivananda, Robert Caldwell, GU Pope, Tamil thatha Saminatha Iyer as also the one of ‘triumph of Labour’. Now here is something more on stautes [report courtesy TOI of date – 30th Jan 2013]…… The Madurai bench of the Madras high court on Wednesday ordered issue of notices to the chief secretary, secretaries of home, highways and local administration departments and the director general of police on a public interest litigation (PIL) that sought the removal of all statues and religious structures in TamilNadu that hinder the free flow of traffic. Madurai-based advocate C Ramesh filed the PIL seeking a direction to the officials to submit to the court a list of statues and shrines on roads and streets in the state that obstructed the free flow of traffic. He also sought the court’s direction to the officials to remove those installations. In his PIL, Ramesh pointed out that there are 16,612 statues in the state, many of which were installed without permission from the concerned authorities. Many statues caused inconvenience to the public, and frequent functions near the statues and garlanding of them led to traffic congestion, he said. The PIL has also sought the court’s direction to these officers to postpone the removal of actor Sivaji Ganesan’s statue, situated on the Kamarajar Salai near Marina Beach in Chennai, till the court takes a decision on his petition. A few days ago, the Madras high court’s principal seat in Chennai passed orders directing the removal of the statue as it affected the free flow of traffic. When the matter came up for hearing on Wednesday, a division bench consisting of Justice R Sudhakar and Justice V M Velumani ordered to issue notices to the officials directing the authorities to remove the Sivaji Ganesan statue from its perch on Marina Beach Road, a bench of the Madras high court had on January 23 noted that public roads should not be used to erect statues. Aside, in a nice article titled ‘How Not To Remember Gandhi’ .. Ramachandra Guha writes about a proposal that was put up for Gandhi statue. He writes of a far more ambitious scheme that was reported in several national newspapers in Mar 1948. On February 29, the Jam Saheb of Nawanagar laid the foundation for a statue of Gandhi on top of a hill 15 miles north of Bombay, adjacent to a village named Chandivilli. The report noted the actual height of the hill – 694 feet – as well as the height of the proposed statue, 79 feet, presumably one for every year of Gandhi’s life. At that time, the Jam Saheb of Nawanagar was the rajpramukh (or governor) of the Union of Kathiawari States. The summit of the hill was to be named Gandhi Shikhar. Obviously it was eaten by time and never came off as googling Gandhi/Chandivilli throws up no results. 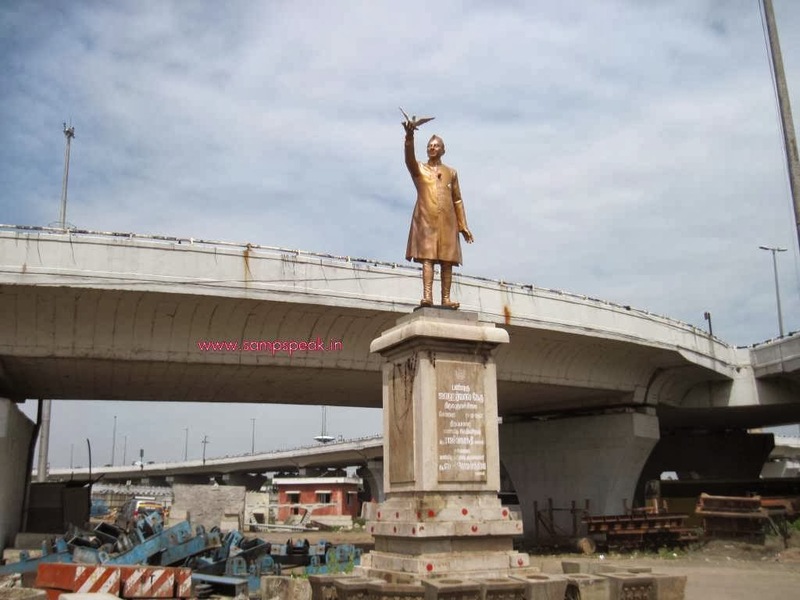 The Congress Party in Tamil Nadu must be appreciated for its pragmatism and not politicizing this ….. in the famous Kathipara where now a cloveleaf flyover exists – was a junction, a roundabout with the statue of India's first prime minister Jawaharlal Nehru. 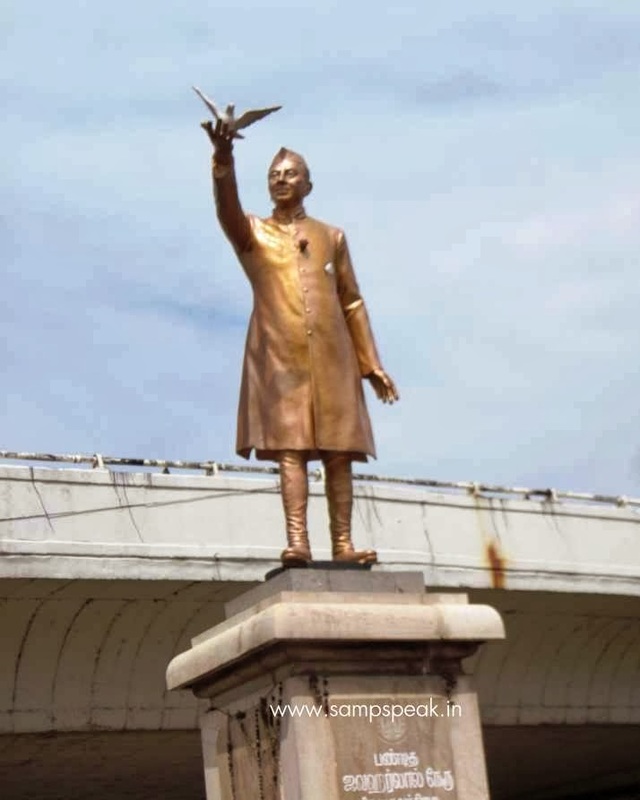 The statue was removed from its place to give way for the flyover and now stands forlorn in the roundabout from airport towards Porur beneath the bridge. It has some added significance as on that fateful day in May 1991 –on a election campaign, Rajiv Gandhji landed up at Madras, met the press, stopped at Kathipara Junction at around 0915 pm to garland Jawaharlal Nehru’s statue …… reached Sriperumpudur, garlanded the statue of Indira Gandhi and took that fateful step at around 10.20 pm at Sriperumpudur… makes a sad reading.